PC peripheral juggernaut Corsair has a burgeoning gaming keyboard catalogue that encompasses all manner of switches and RGB lighting. The sole wireless entrant is the K63 Wireless - a tenkeyless model equipped with Cherry MX Red. 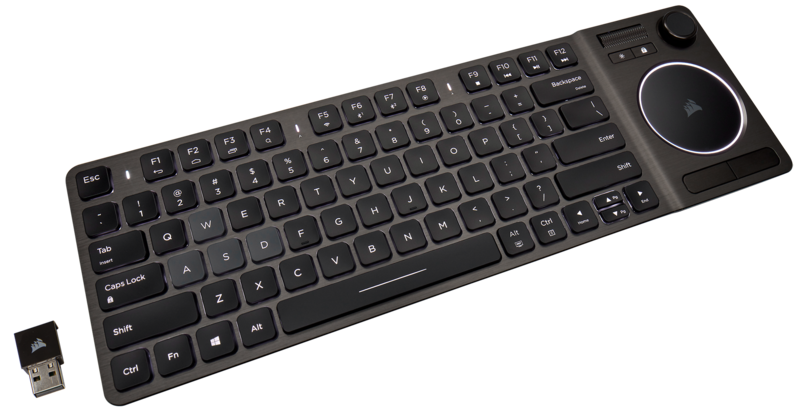 Realising that wireless and multimedia go together, and a year on from its initial foray into cutting wires, the company introduces the K83 Wireless Entertainment Keyboard priced at around £90. Though it does not appear so from a visual perspective, Corsair has taken many of the K63's learnings and rolled them into this model. Connection remains via either wired, dongled 2.4GHz wireless (1ms response) or two-channel Bluetooth 4.2 LE (7ms), with the latter primed for mobile devices. Both support 128-bit AES encryption to stop any snooping, though having it active adds a very small, imperceptible delay. 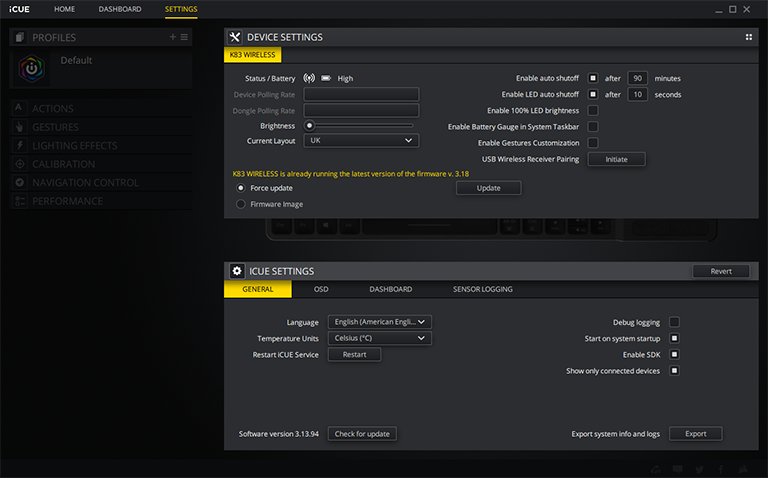 Corsair puts together a handy table that details support via the relevant multimedia hardware - more on that later. 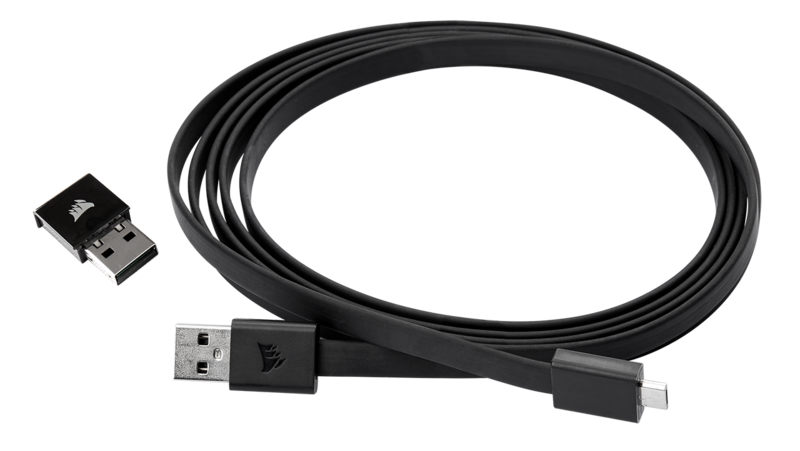 Look and feel are clearly different from its gaming sibling, and Corsair even goes to the length of supplying flat, non-braided cabling. Nice. Build quality is excellent on the brushed aluminium frame that measures 381mm (l) x 125mm (w) x 28mm (h) and tips the scales at 484g. That may sound like a lot in isolation, but even distribution means it is comfortable on your lap or if held by the edges, where the sculpted sides offer good grip. Two rubber strips offer solid traction on surfaces, too. Even though the bottom is plastic, there is no evidence of flex when pushing down hard on the central section. The keys, meanwhile, have anti-ghosting and 20-key rollover support. Their low-profile nature and the island-style design is reminiscent of those ordinarily found on laptops. They're generally muted during the downstroke and, thanks to a grippy surface, are comfortable to type on quickly. This is not a gaming keyboard per se, and is not designed to replace your regular board for day-to-day work, so we're at somewhat of a loss as to why the WASD keys are grey instead of the black found everywhere else. Another gripe is with how small the up and down arrow keys are. Though a personal preference, being left-handed means I really appreciate full-size keys here. As expected, the top row carries a bunch of keys that control various multimedia functions, but what's clever is that their primary functions are just that - hitting F1 acts as back, F2 as browser, F3 as Alt+Tab, etc. - so you need to hit the Fn key in order go down the usual F-key route. Makes sense, right? The right-hand side contains multimedia-specific controls, clearly separating this model from the K63. Lefties, like yours truly, are out of luck as the one-piece construction precludes any other configuration. The precision touchpad offers up to four-finger support under Windows 10 - three on Windows 8.1, two on Windows 7 and Android - and various gestures that can be remapped to initiate certain actions in Windows by clicking on a checkbox within the iCUE configuration software accessed via WiFi alone. Understand that doing so overrides any Windows-only gestures controlled by the operating system. What is difficult to understand is why Corsair chose to make the touchpad circular instead of rectangular, as implemented by everyone else. Surely limiting the surface area, as is the case here, serves little purpose when there is enough real estate to have a bigger pad that punters are used to? A solid plus point, however, is the excellent per-key illumination, often missing on competitor boards, which comes in very handy in the evenings. It can set to one of three modes by default - off, 33 per cent brightness and 66 per cent brightness - though one can dial it all the way up to 100 per cent by overriding the settings within the iCUE software. As shipped, pressing any key or touching the pad activates the illumination, but to preserve battery life, automatically switches off after 10 seconds of no input: you can change the time interval within software. I found the LEDs plenty bright enough at 33 per cent in a dimly-lit room, and Corsair reckons that is good enough for 18 hours of continuous usage before the 2,070mAh lithium-ion battery, which charges in a couple of hours, gives up the ghost. Raising the LED brightness to 66 per cent or 100 per cent reduces battery-life to 12 hours and eight hours, respectively, while having no LED backlighting offers up to 40 hours of use. The small LED between the Escape and F1 keys, meanwhile, provides at-a-glance understanding of remaining charge. Of course, such numbers reference continuous usage, and one can expect the battery to last over a month if used for 30 minutes a day (media mode), or about a week when playing games each evening. Is that good enough? 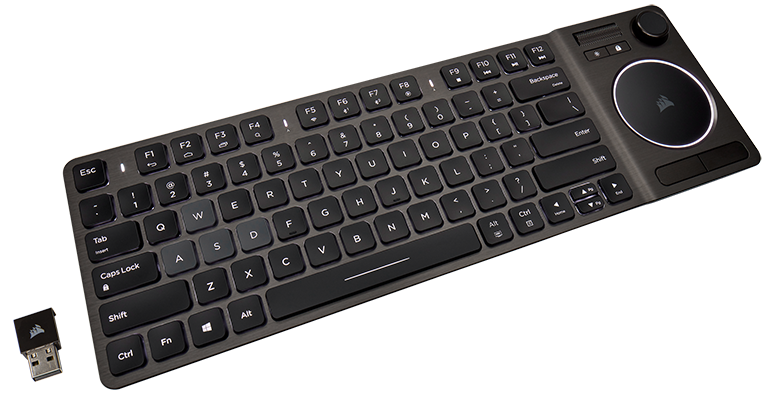 Well, wireless multimedia keyboards equipped with standard AA batteries can last up to a year if used sparingly. The joystick is accompanied by a bumper button on the side (left) and a larger button on the bottom (right). Four-axis movement is fine but accurately pressing down can, for me, feel a bit hit and miss. Part of this is down to the awkward placement of the left and right bumpers used to either select an application or go back; they're not in a natural position when your thumb is on the joystick. I believe it makes more sense to have these buttons, primarily used for multimedia functions, on the other side of the board, controlled by the left hand while the right takes care of the joystick or trackpad. I guess the reason that Corsair didn't do this is because those buttons would be rendered moot when gaming casually - the left hand would be busy with the WASD keys. Perhaps it makes more sense to have them replicated on the other side, letting users decide how best to use them? The F-Lock key, just above the trackpad, mimics the disabling feature that Windows-lock does on other keyboards, but has other uses in an effort to increase the K83's versatility. With it on, ostensibly for gaming, you can use either the trackpad and its buttons or the joystick and bumpers for left- and right-click for controlling the cursor. I found the trackpad to be a better, more accurate solution than the joystick, but neither is as good as using a dedicated controller. Touted as a multimedia/entertainment keyboard, it's only really useful when connected to a PC. Use an Nvidia Shield, for example, and its controller is naturally better at gaming, while the voice-recognition ability largely nullifies the advantage of having a keyboard. This is true of all wireless boards, mind. Connect it to a Samsung Smart TV via wireless and the need for using keys isn't really present. My 55MU6400's smart remote runs the menus far quicker, so much so that I don't miss having any keys at all. Even accessing a title on Netflix is only a minor chore because of the excellent predictive nature of the application's search. That said, the K83 Wireless, for me at least, is most useful when connected to a media-centre PC carrying your movie repository. Navigation is smooth and predictable, the lighting is very useful, and there are enough multimedia functions - the volume roller which presses down to mute, for example - to make it as good as any out there, if not better. Corsair could potentially launch a cheaper model by removing the joystick and bumpers while keeping the lovely keys and lighting present. Add to that a rectangular touchpad, much better battery life, perhaps all for £60-£70, and such a keyboard would be on to a clear winner. I'll stick with my Logitech K830 thanks. Yep k830 for me too …battery lasts a long time .On this the right shift should be minimized and four proper arrow keys, std square touchpad . ALtho I find on the k830 nothing beats using a mouse as well. (for gaming). This also seems expensive @£109 but maybe in a month that will drop to its “real” price of £50-£60 ? ?